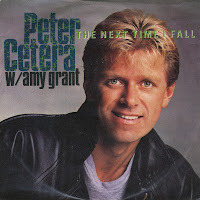 'The next time I fall' was written by Bobby Caldwell and Paul Gordon, recorded as a duet by Peter Cetera and Amy Grant for Cetera's 1986 album 'Solitude/Solitaire'. When the track was released as a single, it reached number 1 in the US Billboard Hot 100 chart in December 1986. It was nominated for a Grammy Award for Best Pop Performance by a Duo or Group with Vocals. In Europe, the single was released, but achieved no commercial success. In 1986, Art Garfunkel released 'The animal's Christmas', an album composed by Jimmy Webb as a cantata that tells the nativity story from the perspective of animals that were there. 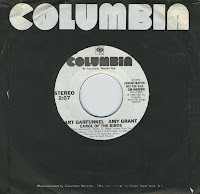 On the track 'Carol of the birds', lead vocal duties are shared by Art Garfunkel and Amy Grant; they recorded the track in Nashville, Tennessee. This American promotional 7" single features that track. I don't know if it was released commercially as there is no information about that anywhere on the web. Could be this is quite the collector's item, but I don't know. I do like this track, it's one of those records you have to hear once a year on a day like today. Joni Mitchell originally wrote 'Big yellow taxi'. 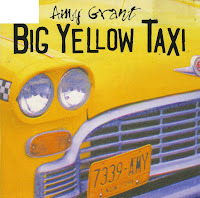 She commented about the song: 'I wrote 'Big yellow taxi' on my first trip to Hawaii. I took a taxi to the hotel and when I woke up the next morning, I threw back the curtains and saw these beautiful green mountains in the distance. Then, I looked down and there was a parking lot as far as the eye could see, and it broke my heart... this blight on paradise. That's when I sat down and wrote the song'. Amy Grant recorded her version of this song in 1994 for her album 'House of love'. In my opinion, it's the best version of the song. It reached number 20 in the UK singles chart and number 67 in the US Billboard Hot 100. 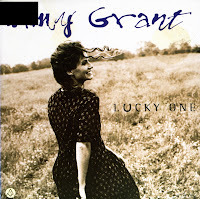 'Lucky one' was released as the first single from the album 'House of love' by Amy Grant in 1994 in the UK. In the USA, it was the second single, following the title track, which was a duet with Vince Gill. The single performed slightly better on the US Billboard Hot 100 chart, peaking at number 18. In the UK, this single reached number 60 in August 1994. 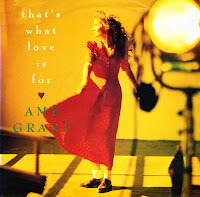 'That's what love is for' was released in 1991 as the fourth single from Amy Grant's album 'Heart in motion'. In America, it was one of the few from the album to be released both to secular and Christian radio stations. The single peaked at number 7 in the US Billboard Hot 100. In the UK, the single reached number 60. The song was remixed for the single, but remarkably enough the single mix appears on the B-side of this single. 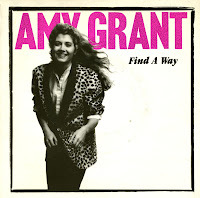 I can't help it, but I am still suspicious when I listen to any song by Amy Grant. Since she started out as a Christian music performer, I'm always afraid she is secretly trying to brainwash the listener (in this case, me) and getting them to convert to the Christian faith. Take the lyric of 'Every heartbeat' for instance: 'No exception to this rule / I’m simple but I’m no fool / I’ve got a witness happy to say / Every hour, every day'. A witness? What witness? You don't mean God, do you? 'Every heartbeat bears your name / Loud and clear they stake my claim / My red blood runs true blue / And every heartbeat belongs to you'. There she goes again... She's talking about God, isn't she? Well, maybe I'm paranoid and it's really just a nice little lovesong. That's what I prefer to believe anyway. The single peaked at number 25 in the UK singles chart. 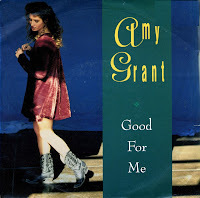 I happen to have both the cd-single and this 7" single of Amy Grant's 'Good for me'. The B-side of this 7" single is not included on the cd-single, which makes it a nice item. 'Good for me' was released as the sixth single from Grant's 1991 album 'Heart in motion'. It reached number 8 in the US Billboard Hot 100 and number 60 in the UK singles chart. 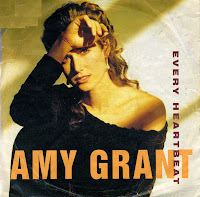 Amy Grant was moving firmly into pop territory with her 1991 album 'Heart in motion'. 'Baby baby' was the first single drawn from the album and it was the biggest hit of her career. Not only did it top the US Billboard Hot 100 chart, it also reached number 2 in the UK singles chart (her first and biggest hit in the UK) and number 31 in the Dutch Top 40 (her only hit in the Netherlands). I didn't like the track upon its release, but in 1995 I got an Amy Grant tape from a friend in America and since then I was hooked. Amy Grant had just earned the title 'Queen of Christian Pop' in her native USA when she changed direction and started recording secular albums. She wanted to become as successful in the mainstream as she had been in Christian circles. Her 1985 album 'Unguarded' was an album not very different from other artists production-wise, but the fact that her lyrics were no longer riddled with references to Jesus, God and the Bible shocked her fanbase. 'Find a way' was a single from this album and it became a hit in America. She didn't cross over to Europe yet (it would take her a few more years to do that), but this single is a promotional copy made in England. Proof that A&M Records were already trying hard to try and make her a star in the UK too. 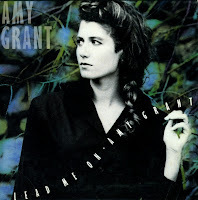 I'd just discovered Amy Grant's albums 'Lead me on' and 'Heart in motion' when she started to release singles from her new album 'House of love'. One of those singles was 'Say you'll be mine'. I bought it on the hunch that this material might be just as good. I was not too disappointed: the songs were a bit on the bubblegum pop side, but still nice and melodic. Grant didn't score a big hit with this: it roamed the UK singles chart for only two weeks in the autumn of 1994, peaking at number 41. 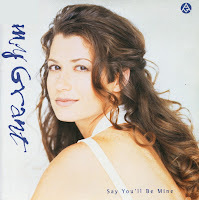 Amy Grant's 1988 album 'Lead Me On' contained many songs that were about Christianity and love relationships, but some interpreted it as not being an obviously 'Christian' record. The single 'Saved by love', taken from the album, was a minor hit, receiving airplay on American radio stations featuring the newly emerging Adult Contemporary format. This is one of the few singles, if not the only single I own that is obviously Christian. The lyric of this song mentions the name Jesus in a non-derogatory context, which is usually something that makes me physically sick. But I have to admit that the melody of this song is simply beautiful, the music brilliantly arranged. And Amy Grant has got a beautiful voice. It's a shame that she is so damn religious. Amy Grant was born on November 25, 1960 and made her debut already in 1977. She made a career out of recording Christian music, which got her a lot of critical and commercial acclaim in those circles. In 1988 her music took on a more contemporary pop form, when she released the album 'Lead me on'. The title track deals lyrically with slavery and the Holocaust. The lyrics also talk about man's relation to these events and man's relation to man. 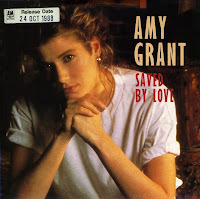 The message of the song makes it very strong, unusual for Amy Grant, who was known for her meaningful but light lyrics.